It's a good strong vintage for arachnids. The vineyards are full of Golden Orb spiders whose beautiful webs are spun from the toughest silk known in nature. 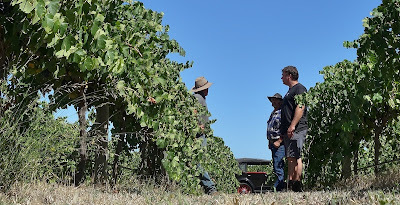 The vineyard blokes here where I live fit their quad bikes with a light-weight head-high poly frame in the front to keep the webs off. They make it from dripper line. Sort of a locomotive cow-catcher for spiders. Spiders are about as popular as Red-bellied Black Snakes in these parts. Folks get twitchy. 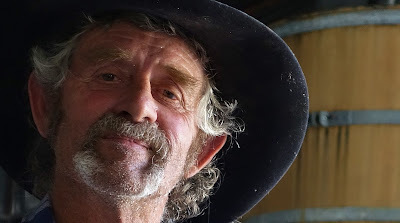 Sitting in Tim Geddes' Blewett Springs Seldom Inn winery over the ridge from here, we were discussing this with the revered stockman, Graham 'Cowboy' Bramley. 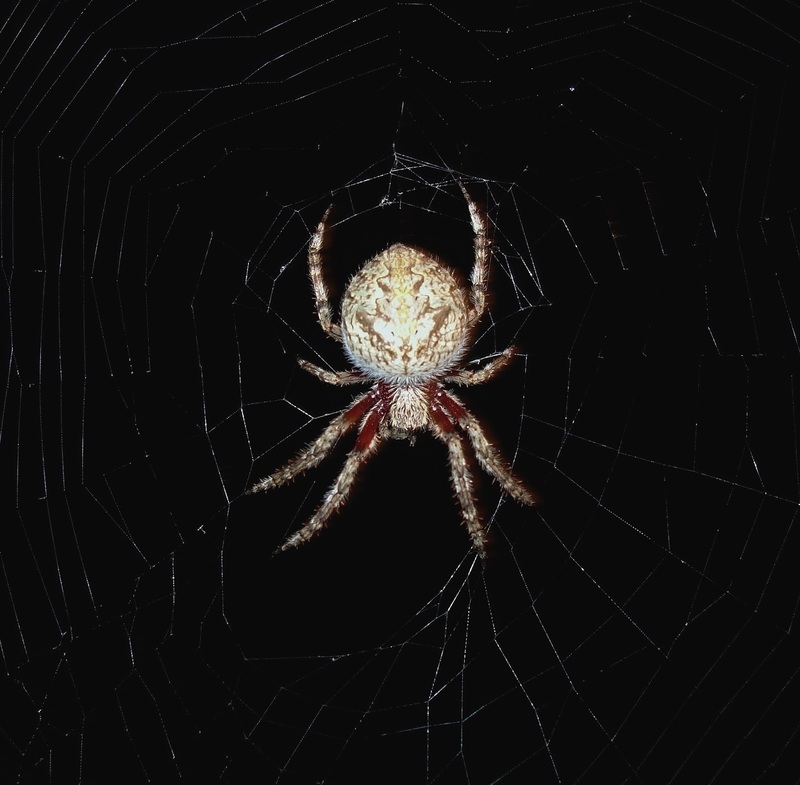 We were joking that there's no money being spent on training Golden Orb spiders to lay off eating each other so they could be farmed in a sort of Orb Spider feedlot to make the type of thread used in re-entry parachute webbing and bullet-proof vests. "You don't have to farm 'em," Cowboy (above) said, pulling a neat silver plait from his hat band. "See this? This is the cracker of a stockwhip. It's a spare. When the webs are thick in the bush we ride through 'em deliberately and get 'em all over us. Then we roll 'em off our clothes with our palms and rub 'em into thread and plait it. Best whip crackers you can get." Sitting there with a red in a shed talking about spiderwebs and this wizened bloke matter-of-factly pulls a perfectly-made example from his hat, just like that. Cowboy's run cattle all over Australia. His knowledge of the outback country is profound. He is much sought after for his old bush knowledge. 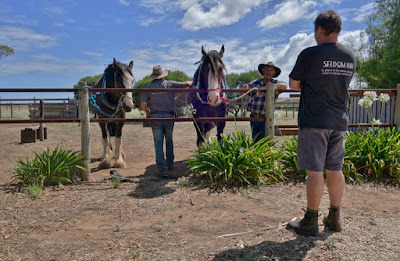 He spins astonishing tales of where rare birds live in the desert, and all the tricks and difficulties of running the huge mobs of stock horses required on big cattle droves. 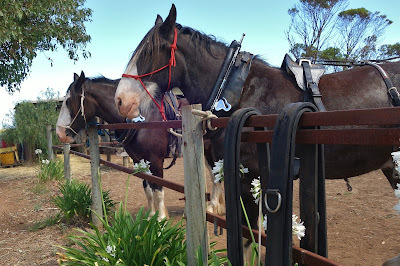 It's hard enough keeping one horse in top fettle in the hard country; sometimes, in his role as horse tailer Cowboy's tended over a hundred: up at 2:30AM for weeks on end, find all the mobs out feeding in the dark by the sound of their individual bells, round them up and have them ready for work at dawn. He said he only bells the weak horse in each mob. The others stick around it. 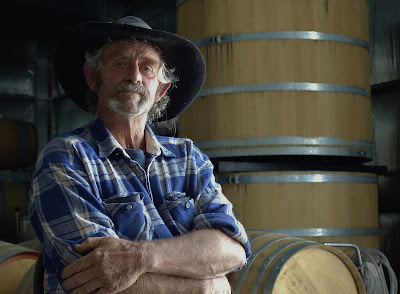 I met him that morning at Darrel Hunt's cheekily named Le-Fleurie vineyard near Maslin Beach on the Gulf St Vincent, patron of viticulturers. It's not quite Fleurieu Pensinsula in the appellation sense, but it sure is closer to that than Beaujolais, where Fleurie actually is. The Hunt family's been on this land since 1908. Old man Maslin's original settler's cottage is well-kept in Darrel's zen-tidy back yard. Embarrassed that generations of heavy tractor work has compacted the ground to a cruel degree, Darrel's run a shallow ripper down the middle of his vinerows to open the hardened earth. He hopes that's the last time he has to do it with the tractor. That clumsy, overweight iron horse is about to be retired while Cowboy and him train the two Clydesdales, Banjo and Malcolm, as full-time vineyard workers. 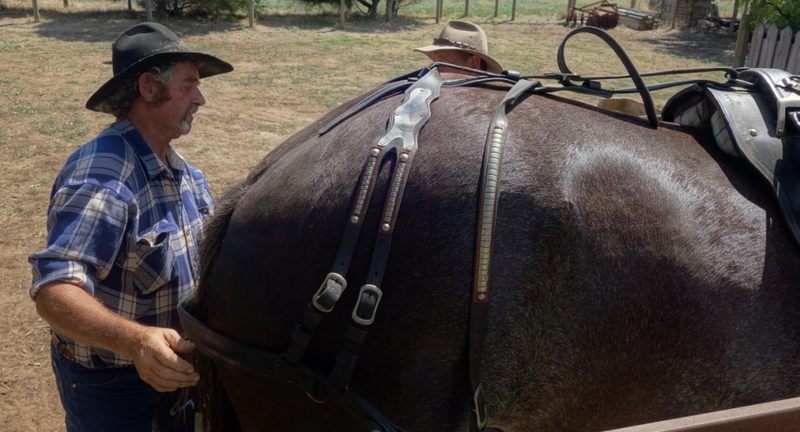 They're already handy pulling a fancy restored barrel-cart; Darrel is scouring the countryside for the other implements he needs to run the vineyard the old gentle way. Anyway, we ended up touring the Le-Fleurie vines in Darrel's 1930 Chev ragtop. Bright blinking summer sunlight: perfect vintage cool. 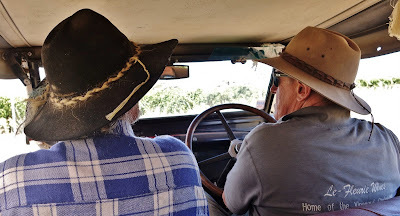 Sitting behind Cowboy, without even imagining what it was made from, or what it could be for, I'd photographed that neat spiderweb plait amongst the colours of the Aboriginal flag on his hat. Which brings me to the wine. 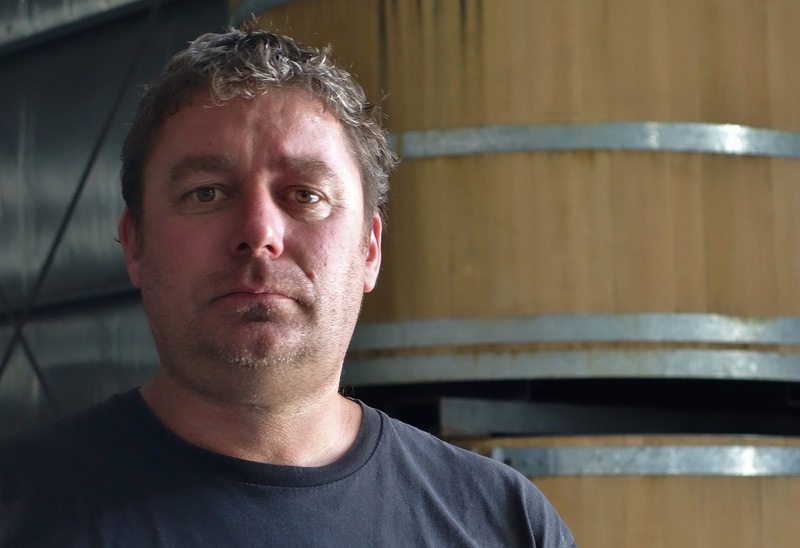 Tim Geddes first took me to Le-Fleurie years ago to kick rocks. The neighbourhood has a ferruginous pebbly sandstone cap on the deep Maslin Sands deposit below, with irony-sandy clays and on Le-Fleurie, rises of the fossiliferous limestone of the Port Willunga Formation. 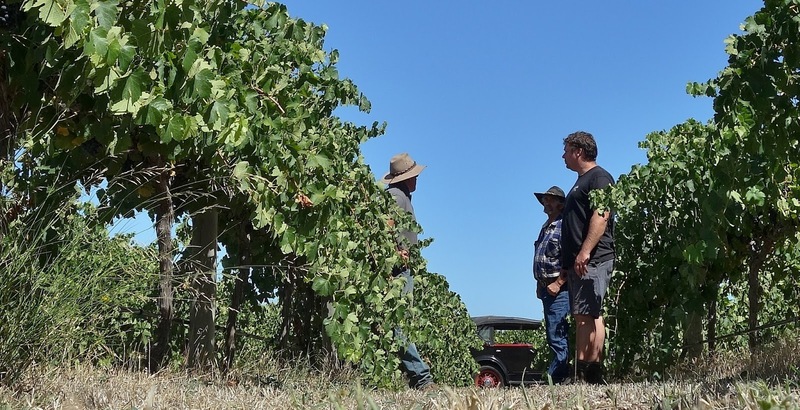 In other words, one of the various spots around McLaren Vale where the rootzone profile very closely resembles Coonawarra's best in its red-dirt-on-limestone centre. 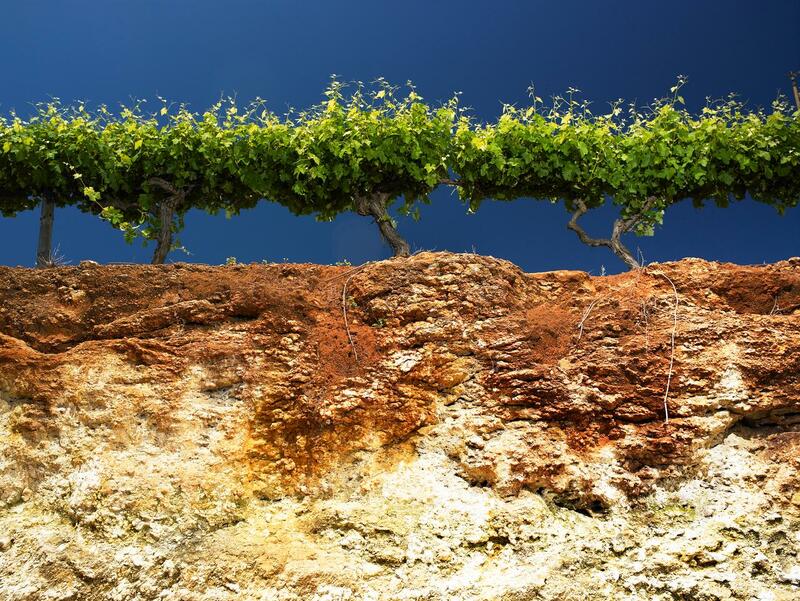 The big difference at Maslin is that its limestone has a hundred metres of loose coarse sand deep below it. 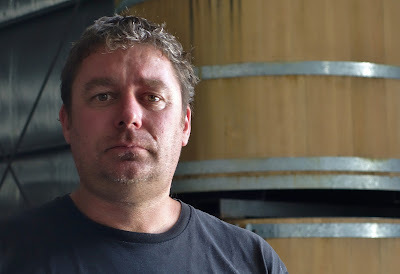 But the wines are similar: perhaps the constant maritime humidity of Maslin giving Le-Fleurie softer tannins. 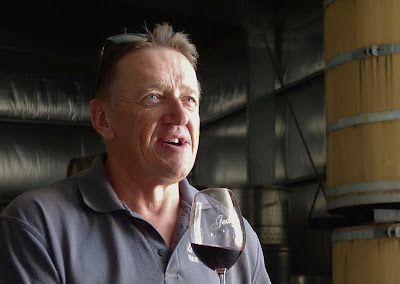 It was too easy to spot Tim's entry from this site in the recent McLaren Vale DistrictsTasting: I reported before about the wines from the various calcareous grounds being very distinctive in the 2016 Shiraz. 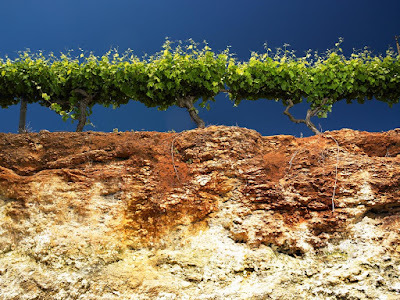 With all due respect, the 2016s from old seabeds were like Coonawarra. Tim's been buying Darrel's fruit for years. It's an essential part of his soulful but sharp suite of Geddes Seldom Inn reds. Darrel also makes wine from some of his fruit next door in Alan Dyson's shed at Maslin. These are not for sale, but Darrel's pretty quick to share one if you're lucky enough to visit. While Cowboy sat in the barrelhouse draping its cool shade with his beautifully-turned anecdotes, Tim opened a line of wines that were composed mainly of Le-Fleurie fruit, or were the full 100 per cent. 2007 was a totally skronky mess of a year: the Petit verdot that survived sure lives up to its little green name: it looks about six minutes old. It's really impossibly tight and raw. Uncomfortably so. 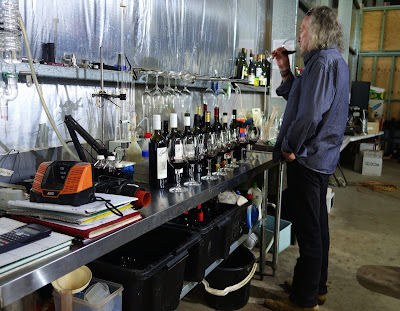 On the other hand, the Shiraz from that same year seemed like the very fresh ghost of the Zema Coonawarra 2013 I'd tasted at about four o'clock that morning. The Seldom Inn 2008 trod the same path. More spooky: the silk-and-velvet 2012 model whizzed me back to the legendary Mildara Coonawarra Peppermint Pattie Cabernet Sauvignon of 1963. That was nearly twenty years old when I first tasted it, but the connection was fast. The biggest stretch of my skill set came with the 2009 60-40 blend of Petit verdot and Cabernet. This incredibly intense raven beauty could hide easily amongst a row of the best Penfolds Coonawarra bin numbers. Like several other offerings there on Tim's bench this will soon be released as a Geddes reserve wine. Start savin' up. He's got PV form, of course, Mr. Geddes (above). He helped Wayne Thomas win the 2004 Bushing Trophy with a cracker. Did it again a few years later with a Shiraz. 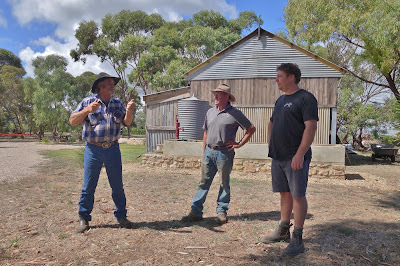 Funny, though: Earlier that day Darrel waved his farmer's fist at his Petit verdot as the Chev purred along the rows. "Bloody stuff! Crop? Does it bloody crop!?! Jeez it bloody crops. Talk about crop ... "
Tim says it's the number of bunches that bedazzles. Darrel's Petit verdot usually chugs along at a modest one or two tonnes to the acre. Maybe him and Cowboy could train Banjo and Malcolm to do a spot of bunch-counting and leaf-plucking. 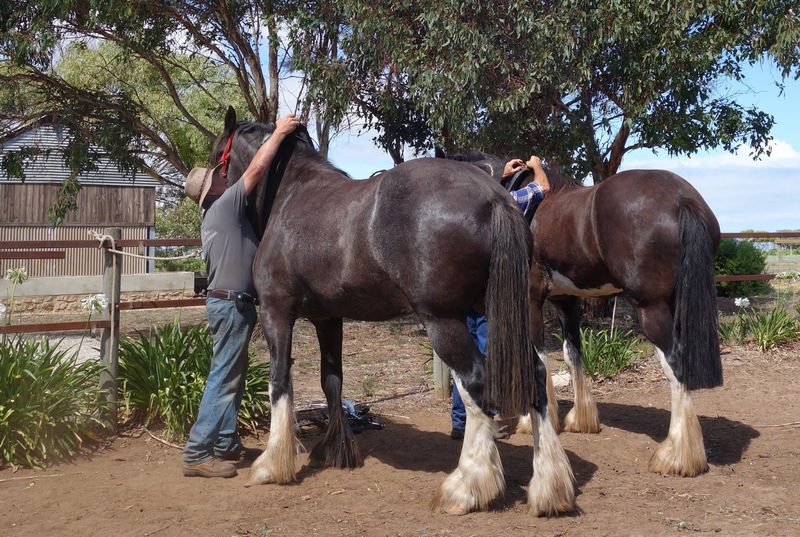 You can't train a tractor to do that with the sort of deeply soulful pondering common to Clydesdales. You could harvest the spider silk from their mighty chests. Only joking. But between you and me, I wouldn't put anything past the wizard Cowboy. Darrel sure knows how to pick his mentors.